Nothing feels better than sharing something you truly love. Give your family the gift of the great outdoors with a Honda TRX90X. 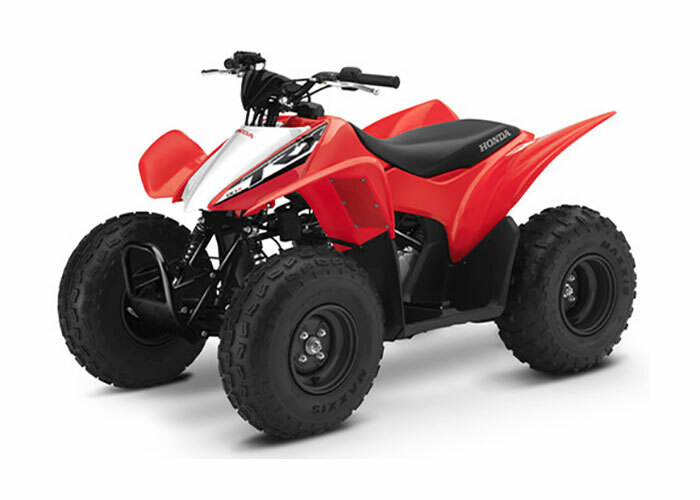 It’s an amazing first ATV that’s designed to be beginner friendly, but still has enough sporty performance so more experienced riders can have fun. Our proven, rugged SOHC engine makes it easier for beginners because it has such a broad powerband. Plus, the electric starter makes getting underway a snap and our no-clutch transmission eliminates stalling, so new riders can concentrate on the fundamentals of control—and just plain fun, too. It’s time to hit the trail with the whole family and the ultra-reliable, ultra-enjoyable Honda TRX90X. RUGGED 86 CC SOHC FOUR-STROKE ENGINE: Honda's proven 86 cc SOHC four-stroke engine offers smooth, useable power delivery and legendary reliability. Convenient, push-button electric starter ensures hassle-free starting in all conditions. SEMI-AUTOMATIC TRANSMISSION: The TRX90’s durable automatic clutch makes takeoffs and shifting a breeze, while the versatile four-speed transmission is geared to deliver adequate power for appropriate riding conditions. NEW COLOR OPTIONS: Choose between the Olive color option with exclusive Honda Phantom Camo® highlights or the classic Honda Red. Plus, both the Olive and Red models sport black frames and black wheels too.